If you want to write a short story for your own pleasure, to share with friends, or to win a short-story writing contest, WhiteSmoke English Writing Software can help. A short story, like most writing, needs to use the best English possible. 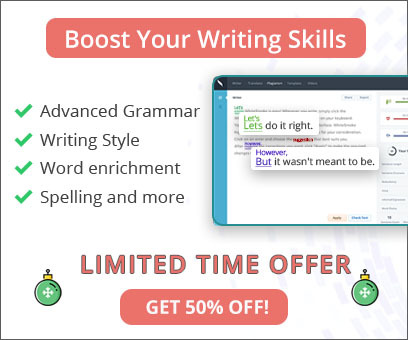 WhiteSmoke's English grammar and spell check will help you edit your story when it's done. Use the unique writing enhancement feature to suggest words while you are writing the short story, as well. 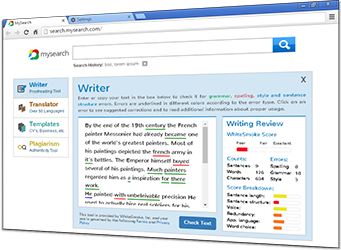 Its online dictionary will assure that you use just the word you mean to use, and the thesaurus software (a powerful synonym dictionary) will help you find a better word when you're not satisfied with your first choice. In order to learn how to write stories, you need to read stories. Lots of them. The technique for writing a short story, after all of your reading, is to start quickly, keep focused, have a theme, and then write. Let the characters lead you. Then, revise, revise, revise. While revising, read some more stories. Here are some more techniques that will help you write a good short story. When writing a short story, the first sentence should make the reader want to keep reading. The first paragraph should convince the reader not to put the story down until the end. Involve readers from the beginning, and make sure that something interesting is being done, said, or thought right up front. Show us the characters, plot, setting, scene, time, as the story progresses, not in the beginning. Limit details to the minimum needed to convey character, theme and plot throughout the story, but especially in the beginning. WhiteSmoke software will help you start with a bang and keep going at a great pace, allowing you to concentrate on the story as it assists you with language. It's like having an online writing tutor at your side, or a professional editor advising you at each step. Around three main characters are enough for writing a short story because too many distract the reader. Don't provide overly detailed background for your characters--only give what is necessary. Let actions and dialogues reveal the character more than long descriptions, let the character's choice of place or activity show the character, not a long psychological analysis by the narrator. For the character to be three-dimensional, so you will need to know more about the character than your readers, but you won't reveal everything you know. Imagining such details helps a writer reveal the character, but the reader probably won't need to know much more than a few brief descriptions that flow with the story. It is far better to show your character through speech, actions, and thoughts than to tell readers about the character. WhiteSmoke's writing enhancement features can offer you tips for the best words at each step of the way. Its unique artificial intelligence algorithms suggest words relevant to your context. WhiteSmoke offers a special creative writing context, perfect for writing a short story. Plot is what happens, the storyline, the action. In a short story, the plot must by necessity be brief and not too complicated--there simply is not enough room. Start with a situation - a problem to be resolved for your protagonist (person on a cliff). Hook. A thrilling, gripping, stirring event or problem that grabs the reader's attention right away. Complication. One or more problems that get in the way of resolving the conflict. Flashback. Remembering something that happened earlier, often before the beginning of the story. Climax. When the rising action of the story reaches the peak--also described as when the complications make the conflict seem overwhelming or unsolvable. Falling Action. Releasing the action of the story after the climax, usually as complications resolve and the end of the conflict appears to be coming closer. Resolution. The conflict is resolved, as well as most complications (the "loose ends"), thus ending the action (plot, story). Whatever story elements you work on, WhiteSmoke's online writing solution will help you write your best English. All of its features will help you with your creative writing. While conflict is a necessary element of plot, WhiteSmoke's English grammar and spell checker will keep your English conflict free. Generalizability. Present a struggle that most readers find meaningful, even if the details of that struggle reflect a unique place and time. High Stakes. Convince readers that the outcome matters. Trivial clashes often produce trivial fiction. The crisis or climax may be recognition, a decision, or some act. The character understands something new, realizes what must be done, or does it. This moment leads to the resolution, when the conflict returns to balance. In short fiction, it is difficult to provide a complete resolution after this turning, and you often need to just show the main character(s) begin to change in some way or start to see things differently. Short stories usually cover a short period of time. There might be a single significant event for the main character or the (connected) events of a single day or even just an hour or two. A short story is often less about the action and more about a message or thread of meaning running through it, and this theme is the skeleton or framework on which you hang your plot, characters, dialogue, setting, etc. As you write, make sure that every character's word, action, description, and deed relates to the theme. Every excess word dilutes the impact of the story. Whatever the theme of your short story, WhiteSmoke Online Writing Software will help you. Buy it now!